Whether it is a block of stone, or wood, the creative genius is born from an inherent passion. 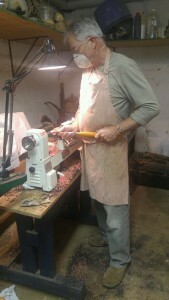 In his case, Neil Holley creator of Holley-woodpens is a definite ‘Woodophile’ (a passionate lover of wood). He enjoys nothing more than taking a block or piece of raw wood and giving it a new purpose, as either a unique piece of furniture, or a beautifully handcrafted pen. That same deft hand that began with a penknife and piece of wood as a boy, has during countless hours of furniture creation, polished and fine-honed his craft. His love of wood was seeded in childhood. Growing up in the bush of Zimbabwe and with regular visits to Game Reserves over the years, beautiful pieces of Burmese, Teak and Emboya were collected and treasured. Business trips during Neil’s busy career years within the furniture industry, were used as additional opportunities to treasure hunt for unique pieces of wood. His wood collection now boasts numerous uncommon types, including the rare and expensive Blackwood. Pieces come from as far afield as Mozambique and Zimbabwe. Two years ago, being a witness to an unfortunate crime incident, turned out to be the favourable catalyst to jump-starting his Refirement dream, that of growing his hobby into a worthwhile additional stream of income. When having to give a witness account of the crime, Neil met a met a likeminded wood aficionado who in turn, taught him how to go about crafting wooden pens. What Neil enjoys most, about this creative process, is the immediate gratification he gets from crafting pens. It is quicker than the more time consuming creation of unique furniture pieces such as lamps, coffee tables or hat racks. Knowing that people’s preferences differ, he produces fountain pens, ball points, roller balls and the most popular – twist ballpoint pens. Neil and his wife Kathy, whom he calls the “Admin Brain’ of the business, run Holley-woodpens together. “I am blessed to be able to divide my time between the Furniture Agency we manage, incorporating the skills and experience gained from some 43 years within the Furniture Industry and now consulting back. I have the added bonus of taking a hobby I am passionate about and using it to create an additional source of income, so necessary in the unstable economy we find ourselves presently living in. I would encourage anyone in the Refirement age group to consider this worthwhile option of turning your particular hobby into an additional stream of income”,” suggests Neil. So whether you’d like to spoil yourself or a loved one with a special gift this Christmas or if you’re looking for an impressionable corporate gift, take a look at the website to see what is on offer and then contact Neil and Kathy via the following channels to place an order. Be warned though, Neil says that one particular pen addict already owns 5 of their pens!